It is an interesting clash at the box office today. Jersey starring Nani in the lead role is an emotional sports drama is clashing with Raghava Lawrence’s Kanchana 3, a horror comedy. Kanchana is one of the successful franchises that always clicks with the target audience. Last film from the franchise looked like it has ran out of gas, but Lawrence is still trying to squeeze money out of it. Jersey on the other hand is one of its kind sports drama which is authentic unlike films based on sports. 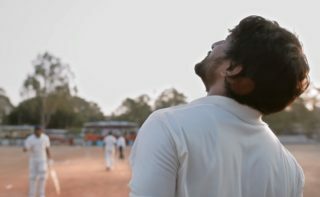 The plot seems similar to the recently released Majili, but Nani’s superlative performance as a struggling cricketer can set Jersey apart. Nani has broken the monotony after doing a string of commercial films. Jersey needs to hit the bull’s eye for Nani not only because of the fact that his last two films failed, but also for giving him the necessary confidence to explore new themes. He is too good an actor to restrict himself to doing routine stuff. Nearly Rs. 50 crore is at stake on both the films. A crucial weekend for Telugu box office it is. We brings to you the Jersey experience and all the excitement of this gripping fare live via tweet review. Movie begins in New York. Son of Arjun goes on flashback mode. Nani as Arjun is introduced. He is a batsman with 28 centuries in first class. Movie is progressing back and forth between 1986 and 1996 in Hyderabad. Movie is progressing realistic way. First song…and romantic scenes are going on. “Adento Gani” song is going on. Nani and Shraddha Srinath’s marital problems are being shown. First cricket match in the film. NZ vs Hyderabad. Emotional scene between Nani, Shraddha and kid. Nani determines to start playing for Indian team. Interval bang. First Half Report: Jersey starts on slow manner but it picks up momentum later. It is more of matured movie. Nani performance is major highlight. Second half begins with Nani’s practicing match. Second half is also moving on slow pace. Second match in the film. Tamilnadu vs Hyderabad. Various cricket matches are being shown. Nani lands in a situation to pick up cricket or family.